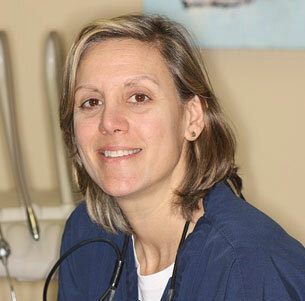 Dr. Maria Longo graduated from Tufts University School of Dental Medicine in 1988. Prior to studying at Tufts University School of Dental Medicine she attended Boston University where she earned a B.A. in Biology after starting as an art major. Dr. Longo has been practicing for over 27 years. She has been in her current location for 21 years. Since she began practicing dentistry, Dr. Longo has kept up to date on many continuing educational classes and technology, ensuring that her patients receive the most comprehensive and advanced dental care. For over 15 years she has been studying the biomechanics of the head, neck, and how it relates to teeth and the rest of the body. She has been treating patients with Temporomandibular Joint pain (TMJ), muscle pain, and tooth sensitivity and wear. She is an active member of The Academy of General Dentistry, the National Association of Dental Practitioners, The Academy of Dental Sleep Medicine, The Orognathic and Bioesthetic Institute, and The Academy of Cosmetic Dentistry. She is a graduate of The Dawson Center for Advanced Dental Studies (2003), The Piper Center (2004), The Schuster Center (2000), and The Orognathic and Bioesthetic Institute (OBI)(2009-2011). She has trained at The Pankey Institute (2007). She is certified in mild to moderate sedation dentistry, as well as Basic and Advanced Life Support. She is currently working on her accreditation from the American Academy of Cosmetic Dentistry.She was selected as one of America's Top Dentists for 2005, 2006 , 2007, 2008, 2009, 2010, 2011, 2012, 2013, 2014, and 2015 by The National Research Council. She has also been awarded a Peer Reviewed Award for excellence in dentistry for 2013. The practice has earned the TALK of the TOWN AWARD for 2010 and 2011 for excellence in service. She was recognized in 2006 as one of the Top International Dental Professionals of the year. She was honored in 2007 by the National Association of Professional and Executive Women. She has published numerous articles in Full mouth reconstruction and aesthetic dentistry. Maria enjoys spending time with her family, oil painting, playing her guitars, and the outdoors year round.